The Englishman philosopher and statesman George Savile (1633 – 1695) once wrote that “the master of patience is the master of everything else.” As do all skills that we can learn to master, however, patience must be first studied and understood, and then practiced often before it becomes an enduring characteristic of our personality. Here are 5 steps to help become a master of patience in a world that seems to have become more impatient. (1) When emotion overwhelms, patience retreats. “Patience” is best described as a state of forbearance or restraint in the face of delay or provocation, without becoming overwhelmed by annoyance or anger. It is the ability to endure something negative that’s found its’ way into our environment, without letting it control our behavior. 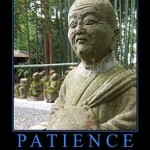 Patience is, in this way, a positive trait and a strength, much like a long distance runner’s stamina and endurance. The tougher it gets and the longer the distance, the more a well conditioned runner can hang in there and finish the race. Patient people also tend to be more successful and better able to deal with crisis, based upon several studies. So, as always, awareness precedes control. Monitor your emotional states. The more powerful your emotional state, the more likely you are in a condition known as an “emotional hijack” and what’s going to come out will likely be reactive, uncontained, and possibly out of proportion to the stimulus. When you are feeling very emotional, BREATHE! When you feel a little less emotional, BREATHE SOME MORE!! When you feel calm enough to say something, BREATHE SOME MORE AGAIN!!! Breathing helps calms us, center us, and gives our more evolved brain time to come on line and respond more thoughtfully to whatever has got our lizard brain howling. (2) Check in before you punch out! Although I’ve never seen it up close and personal, I’ve seen drivers on the interstate in a fit of “road rage’ and I was pretty sure that their anger had caused them to “punch out” of their own body. There seemed to be a whole lot of yelling and screaming going on, but precious little thinking. Patience allows us the time to better assess what we are feeling and how it’s related to the present moment and how, maybe, it’s not. It’s important to develop the ability to give what you’re feeling a precise name. Anger, frustration, annoyance, rage, sadness, grief, disappointment, terror, despair, are all different feelings that have varying levels of intensity, and are more or less powerful energies in our bodies. The stronger the emotional “state,” the harder it is to “think straight,” and the more likely that emotion will hijack you and you’ll literally punch out of your own body energetically speaking. What tends to make you impatient? What make you feel that you are being treated disrespectfully? You’ll find behind each feeling there is a story about how you learned to tell if these things were happening, and what you could or couldn’t do about them. We tend to think our old story is happening in the “here and now” and sometimes it is, but when it’s not we can tend to end up punishing the wrong people. So if emotions and feelings are a story we tell ourselves so that we can make sense of our world, isn’t it important to know your own? (3) Rehearse before the show goes on if you want a different ending. Although each of us may be born with the potential to have greater or lesser levels of patience, it is not an inheritable characteristic like eye color or right or left hand dominance. Just because you come from a long line of people who had the patience level of the Tasmanian devil on the old Bugs Bunny cartoons, does not mean that you’re out of luck! Patience, on some level, is a learned skill, mastered over time with PRACTICE! To master any skill, the formula is always simple and always hard: repeated practice over time. It’s important to remember, however, that the best time to learn how to swim is not after the ship has hit the iceberg! So too, it’s probably a lot to ask of yourself to start being patient when they tell you your flight home to Hartford for the holiday has been canceled due to a storm in Nowhere, Texas, and you’ll be spending Christmas at the airport Hilton! Identify those situations that make you especially impatient and go through a dress rehearsal in your mind. What do you imagine you could say or do that could give you more options? What can you say or do to lengthen your fuse and help you to think your way through the problem? Can you find some way to put what’s happening in a different perspective? What could you gain or learn from the experience? If you can’t help yourself, can you be of service to others and help them? Sometimes, what’s happening isn’t about “us” alone, it’s about “us” being presented with an opportunity to make a difference in someone “else’s” life. That ability to solve our own problems to the benefit of others has often been identified as the true sign of “mastery.” Maybe the opportunity to practice patience is really a chance for you to make a difference in the life of someone who needs it. How’s that for a different way to think about lifes’ frustrations? (4) Is it true? Is it kind? Is it necessary? The first impulse control we tend to lose when we are impatient is over our mouths. We often say the first thing that pops in there, and it’s often hurtful and ill conceived. In terms of some of the people who seem to just annoy us, it can help to remember that most of us do seemingly off center things because we’re trying to get some legitimate need met, but we don’t know how to do it more effectively. So maybe the co-worker who never stops talking desperately needs to know we will pay attention to them, but they never learned how to ask for it directly, or to believe that someone would ever find them worth paying attention too even if they asked. So a good rule of thumb is that before the lizard brain pries open our jaws and we say something we might regret, try to give the higher brain and, most importantly the heart a chance to get in the game. Especially when you’re feeling impatient, ask yourself 3 questions about what’s about to come out of your lips: Is it true? Is it kind? Is it necessary? If the answer to all 3 isn’t an unequivocal “Yes,” then it’s a pretty sure bet you won’t be making a mistake by holding your piece, or finding a different and better way to say it. A good rule of thumb is also if you can’t improve on silence, nothing need be said. There’s more than enough sadness and hurt in the world; patience is often how we have the strength not to add to it. (5) Impatience can be a sign that a boundary needs to be attended too. Feelings give us information about our environment. They are neither good nor bad, they just provide guidance. So distinguish when the impatience is about you, and when it IS about the person. Although our response must be proportional, patience isn’t appropriate when someone is being physically, psychologically or emotionally inappropriate. Boorish behavior needs to be given an name and dealt with, but almost always in a controlled manner. It is absolutely okay when someone violates, or attempts to violate, your boundaries, to “name” their behavior and tell them to stop. Strangely enough, however, the more you know in your heart that you are generally patient as a person, the more you’ll trust and see clearly when inappropriate behavior needs to be named and dealt with, if necessary, vigorously. So, I wish you well and good luck in your practice of patience.